The approach seems spot on to me. I particularly like the focus on economic theory in practice that does not involve a lot of mathematics or charts. I am very excited about this text. I really don’t have anything else to compare it to and right now I am mostly trying to push this info into my teaching on my own with very little textual help. You have hit upon an important market for economics in the core social studies and, importantly, in a manner that will make the subject attractive for many classes where economics is given a passing glance because the materials available to teach the topics are too technical. I love the Table of Contents. The subjects are engaging and thought provoking. It was really fun to read, I can’t wait to see the final product. You’re creating something very special and unique. There is no other supplement for High School students that even attempts to do what this supplement does…. I believe this supplement will fill a gap in the current American history curriculum. … I have not seen other supplements integrating economics and history. … Most of the books I have are not intended for classroom use and as such, require a lot of time to create lessons and activities. I like the approach ... (and) … agree with the author’s rationale that economics is often left out of history education, which is doing a disservice to the subject. The template for each chapter is excellent. 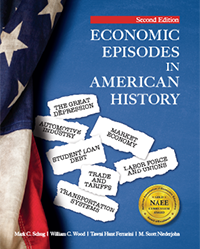 I like the approach of examining historical facts which are derived from historians and applying economic principles to analyze these facts all together ... (and) help students to solve mysteries/problems and gain a better understanding of U.S. history.